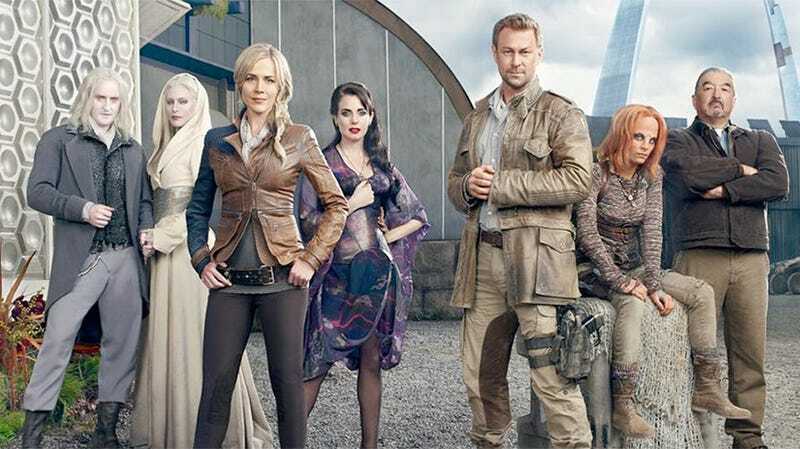 Defiance The Show Gets A Season Two. That's Not Good For Me. SyFy and Trion World's crossmedia experiment seems to be a hit in both intereactive and non-interactive form, with more than a million active accounts in than a million registered accounts for the MMO and nearly four million viewers tuning in for the television series premier. Today Syfy has announced that it's renewed the TV series for another 13 episodes starting in 2014, despite it being pretty damn mediocre so far. What? I'm not a fan, and it's sad, because I should be. An ensemble cast, aliens on Earth, a video game tie-in — this is a property made with me in mind, and I'm just not getting it. It's not the game. It's a solid-if-repetitive shooter with an interesting storyline and some engaging driving segments. Trion has five paid and non-paid expansions due out this year alone, adding new playable races and gameplay types to the mix. Left alone, it might blossom into something really worthwhile. But it's not alone. It's tied into a television series set in a location half a continent away from the game's setting. It features characters similar to those in the television series, but the actual stars appear only briefly. There are going to be regular content updates that fold show content lightly into the batter, but it doesn't look like the two will ever completely be in line. But Syfy and Trion will keep trying, and that's a pity, because the more I watch the show, the less I like the game. The launch of the show brought the MMO logs to a screeching halt. It's the aliens in the powder make-up and horrid blonde wigs. It's the generic gruff hero with a heart of gold Grant Bowler. It's Julie Benz, whom I love, but really isn't convincing me there's a reality in which anyone would elect her mayor of a cheese sandwich, let alone a wild frontier alien town. It's the fuzzy aliens that look like Sid and Marty Kroft creations. Defiance the game has promise, but every time I try and play I get the taste of the television series in my mouth. It tastes like powdered wigs and prosthetic glue. It's the fake of the live-action disrupting my virtual reality, and it's going to keep happening for at least another year.